There’s probably nothing in the birding world that engenders as much ire as the perception of suppression. one of the tenants of our community, and one tightly held by many of us, is that information about unusual birds should be freely accessible. That’s why we have listservs, and rare bird alerts, and the like. When a bird that people want to see is discovered, the idea is that people should get to see it. Of course, that’s the ideal. In reality there are many issues that can crop up with regards to such birds. Access, being the primary one. Birders are sharers, but that doesn’t mean a homeowner has an obligation to consent to days, maybe even weeks, of strangers traipsing across their home and property. It can be frustrating when homeowners cut off access, but there’s comfort in knowing that in many cases that means access is closed to everybody, save maybe a bander. But when a bird is made available to a small group of birders and to no one else, well, that’s when drama happens. To be among that crowd you need to make contacts, meet people. It’s the sort of thing you obtain only with time or luck, and new birders can often be left out, unfortunately. As an advocate of open-sourced birds, it was a little strange to get a message from a friend last week about a large, tropical-looking hummingbird in not far away from my home. I admit, though, that I dwelled on it for only a moment as I grabbed my binoculars and camera and hopped in my car, thankful to have made a few connections in the area. 40 minutes later I was standing in a courtyard in Winston-Salem as a huge, loud, hummingbird came buzzing through. Not a Ruby-throat for sure, not even a Rufous. 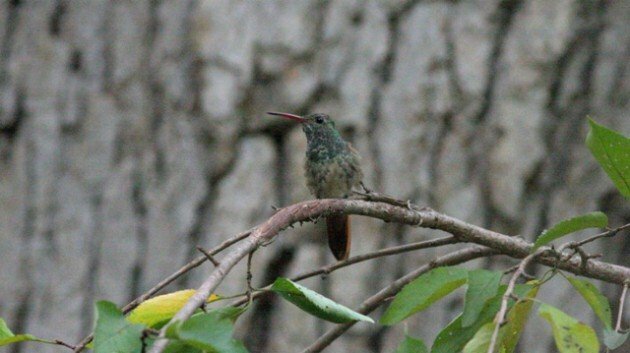 Closer examination nailed it down to Buff-bellied Hummingbird, North Carolina’s 2nd record. The homeowner was kind, but hesitant to open her home to the many birders likely willing to travel to see this individual. Not only was it a dynamite bird for the state, but it’s location in the center of North Carolina would make it easy for birders on both sides of the state to get to. So I was asked not to eBird it immediately, not to post it in various social media channels like birders do these days. A fair request, under the circumstances. Banders were coming later in the week, it would be announced then. Well, it wasn’t more than 24 hours that the homeowner’s mind had changed. She granted permission with reasonable hours, the bird made the listserv, and the chase was on. My time as a suppressor lasted not much more than an afternoon, not all that bad under the circumstances and barely long enough for me to feel much guilt at all about it. Since I saw the bird on that first day, dozens more have had the pleasure as well, and eBird is filled to the brim with records of this individual, thanks entirely to the kindness of the homeowners. It;s always nicer when a bird like this can be shared.